Join us for this unique journey along the Caledonian Mainline, with an ex-LMS ‘Princess Coronation’ class locomotive; recreating the halcyon days of the 1950s, when Steam reigned supreme. 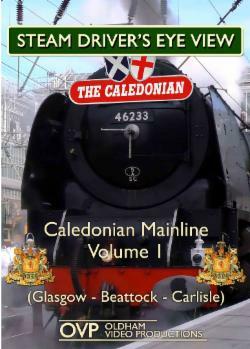 Departing southbound from Glasgow Central, we take the West Coast Mainline recreating some of the classic express trains such as the Royal Scot, Caledonian and the Mid-Day Scot expresses from the Steam era as we climb some 20 miles through Motherwell to just before Carstairs. From here we continue climbing at speed snaking between the Southern Upland hills at Abington and Crawford before topping the climb at Beattock Summit. Once over the top we descend at speed towards Lockerbie and cross over the English border to the city at Carlisle. With live sound recorded from the locomotive, we bring the action right to you. This program also features on screen locations titles, including commentary from the locomotive’s crew.